The Analog Devices ADXL1003 provides ultralow noise density over an extended frequency range and is optimised for bearing fault detection and diagnostics. The device has a typical noise density of 45μg/√Hz across the linear frequency range. MEMS accelerometers provide stable and repeatable sensitivity and are resistant to external shocks up to 10,000g. The integrated signal conditioning electronics allow features such as full electrostatic self-test and an overrange indicator, beneficial to embedded applications. 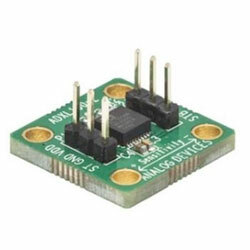 With low power and single-supply operation of 3V to 5.25V, the device also allows wireless sensing product design. The device is offered in a 5mm x 5mm x 1.8mm LFCSP package and operates over the −40C to +125C temperature range. Typical applications include condition monitoring, predictive maintenance, asset health, test and measurement, health usage monitoring systems, and acoustic emissions.